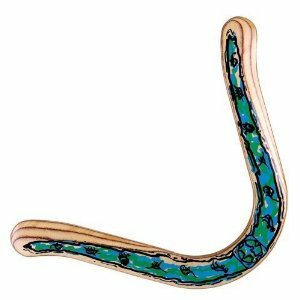 Although this looks suspiciously like a wooden worm, it is actually a boomerang. I love everything about library summer reading programs, but the thing I love the most is the swag: the little sheet they give you so you can fill in the names of the books you’ve read. The stickers you stick on the little sheet as evidence that you’ve finished a book. The bookmarks! The buttons!! And the prizes: the ticket to an A’s game, your very own paperback book. Which brings me to my favorite summer reading prize of all time, the one they’re giving out at the Berkeley Public Library this summer: a boomerang. No. Really? I love that. The boomerang is the perfect symbol for what happens when you become an enthusiastic reader. You read that book and your first reaction is almost always to tell someone else about it. And before you know it, they’re telling you about the book they just read that you’ll like too. That’s about the path of a boomerang, isn’t it? I’m pretty sure I have a point here. Yes, I do. I’m going to have a BlogLily Summer Reading Program because I don’t see why kids should have all the fun. It will involve downloadable swag, so you too can follow along. You might have to supply your own stickers. In a pinch, you can just draw something. And yes, there will be prizes. Stay tuned. I’m not an artist. But I figure I can make a decent summer reading sheet thing. I’ll give you the sheet, but you have to write down your books. Most importantly, you have to do that “more like this” recommendation. You don’t, however, have to give them boomerang ratings. Unless you want to. And even if no one signs up, because, you know, kids these days are too busy playing on their i-things to fill out the reading program sheets, I will still be doing this. In advance of the official roll out of the BlogLily Summer Reading Program, I am going to report on my very first summer reading book. I’m well on my way to winning that boomerang. Before it was cancelled because it was probably not a great show, the bloglily household spent many pleasurable Tuesday evenings watching a show called The Event. It was about aliens and humans, and whether they could live together when there were a lot of aliens and the humans were taking up all the room. What I loved most about this show was the hero. He was an unlikely hero — a good looking young guy of about 30, with what looked like excellent computer skills and a fine future in IT. But then, oh, but then! His life is turned upside down and suddenly he is on the run from pretty much everybody. And you know what? He acquits himself beautifully, despite the fact that he was really headed for a tech career. Turns out, he’s strong and fast and totally driven. Plus, it comes in handy to know how to hack into the CIA’s computers. Plus the white house’s. That’s what the hero of William Boyd’s Ordinary Thunderstorms is like. He’s an unassuming enough scientist who knows a lot about clouds. And then, and then — he witnesses a murder, gets blamed for it and all of a sudden, he’s sleeping on the ground and growing a heavy beard. That he acquits himself well gives nothing away. The pleasure is in reading how he does it. What could be a more perfect summer book than that? It is not, for example, Tess of the d’Urbervilles. Quite possibly, and objectively Tess is a better book than Ordinary Thunderstorms, but, if what you’re after is a hero who’s good on the run, Tess is not your woman. .
Only criticism: Actually, not a criticism. More a thought. It’s awfully hard sometimes to pick a really good villain. But pharma? Somehow that’s just not scary enough. Are there more like this? Well, there’s a great Harrison Ford movie called The Fugitive that you might enjoy. Doctor on the run. I believe Tommy Lee Jones is chasing him. Oh, fun! A summer of book geekery! Do we get stickers? Why, yes. I have at this very moment decided that anyone who comments on the BlogLily Summer Reading post will get an official Summer Reading Packet — if they want one, I mean. It will contain a reading log (although I’m making a .pdf file, so really, you don’t need the log if you have a printer.) And it will also contain stickers. I might even get really riled up and make some bookmarks. Anything to keep myself from revising. And if you happen to, you know, have a sudden inspiration about what a great summer reading log would look like, let me know!! I’m rolling out the Program next week — Wednesday, I think. Oh. I forgot to add — I love the boomerang! And your drawing looks like St. Exupery’s drawing of a snake — before he ate the elephant. I haven’t read that book in a while, so maybe I need to go find my copy of Le Petit Prince. Cam — that’s great! I’m looking forward to making my form. And yes, snake pre-elephant it is!! I’m not in now, but maybe later. I do not read novels while I’m writing my own novel. I can read short stories and sometimes do, but not novels. That’s just how I roll! Although I guess I could be in if it’s okay to read non-fiction for the summer program? Although most of what I’m reading right now is magazines! Do magazines count? I’m guessing not. Please clarify the rules. The official motto of the BlogLily Summer Reading Program is “books are not broccoli,” which is intended to express the general sense that you can read whatever the hell you want on the BlogLily Summer Reading Program. No one has to read Huck Finn, or The Sun Also Rises, or Ulysses on this program. (Not that they are precluded from reading them, of course.) There is no reading list . There are no rules. It is the anti-reading list summer reading program. Which means, in your case, sign up, get some swag, and keep right on reading those magazines. I just adore that boomerang diagram – it’s perfect! Lacan would be so proud of you. I’m so up for a summer reading programme; I don’t even need stickers as an incentive, but I’ll certainly take them if they’re going! I’m very excited about this — in a crafty, geeky kind of way. I have begun to make my little reading program packets, and I will be mailing them out this Friday. It’s a first edition of the BL Reading Program, and here you are, on the ground floor. It is not like buying Apple stock in 1980, but it is something. I love your summer reading program idea! Every summer when I get an email from the library about the big program I am perpetually disappointed because it is only for kids. And then I think, gee, I’m short, maybe I could pretend I’m 13 and no one would notice a few gray hairs. Or all the other things that would give me away. So, yes please, I’d love to enroll in the Bloglily Summer Reading Program 🙂 Love the boomerang btw! Adding Ordinary Thunderstorms to my reading list. And I think I need to talk to my local library about a Summer Reading list program avec stickers. Stickers would be another incentive for me. Boomerangs, too. I’m about to read Room by Emma Donoghue. Oh, how I love the shapely boomerang, and how the word boomerangs around in one’s mouth. I remember as a small child, I often called a boomerang a frisbee, and vice-versa. I had some kind of aerodynamic dyslexia. They were so different, yet so similar: both were tossed, both flew through the air above wide grassy expanses, both made appearances in summer…. Anyhoo, please sign me up for the Bloglily Summer Reading Program! Wonderful idea, Lily. I’m going to see if “Ordinary Thunderstorms” is available on Kindle. Wow. Look at all these readers of your blog. Must be really something to have more than one of them. Anyway, is it ok to listen to the books, if you’re blind? Or do you have to go with the braille? It’s true that with the braille, you don’t have to rush. You can settle back and think about what you’re reading, or, you know, touching. Sometimes the book touches you. Sometimes you get bored and touch yourself. Sometimes… but now I’m drifting. I read Snow Crash the other day. It used to be popular among head-banging teens, but now I don’t know. This sounds great! Sign me up. I love the idea of having no rules — just swag and prizes! There are some things I need to read this summer, but there will still be lots of fun reads, and I’m looking forward to it. If only life had more swag and prizes, Dorothy – wait, let me try that again. If only SUMMER came with more swag and prizes being an adult would not be so bad. Stay tuned for more details tomorrow. Hey Joe — Well, I’m glad you’re here! Braille? Fine. Listening? Fine. (There are so few rules, that if your particular book came in chocolate form and you simply ate it, that would also be fine.) I just googled Snow Crash — that book sounds great. I’ll see how it goes with the teenagers in this house. Tai — I have never even seen an actual boomerang. I think I might have to get one. As for Ordinary Thunderstorms, I happen to have a copy of it if you’d like it. We do live in the same neighborhood, after all. I also am in, absolutely. I have always loved those lists and felt utterly lost the summer after our freshman year in college when no one kept summer reading lists any more. That, if anything, made me feel that I had lost my childhood forever. But, no! Thanks to you, summer feels summery again. Entire kit, please.